Meh. I tried MAR after reading several good reviews. I liked it well enough, but there was nothing that rocked my world. There is nothing unique about this story. Boy is an ordinary loser at home, but he falls into a secret world where he's strong and important. Part of my issue with this manga is that I'm not really into Shonen manga (action based manga, mostly for boys). You'd think with a name like Marchen Awakens Romance there would be some romance in this story. Perhaps there will be in later volumes, but the only hint of it in this volume was a crush on a friend back home. This is all action. 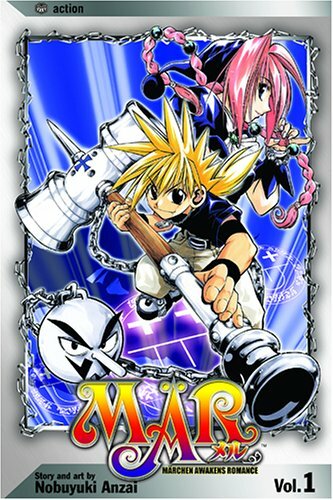 Ginta is a fight-magnet in his fantasy world. Once one fight sequence is over, another begins. Anzai does a good job of drawing lines so you capture the excitement of movement of the action scenes. It does make it a bit hard to look at - it almost feels like the page is blinking at you. The manga is fairly spare on dialogue. The story is definitely told mostly through pictures. The lack of words makes it harder to understand the supernatural world Ginta fell into. I imagine it will become clearer further into the series, but it doesn't make me want to continue on to find out. There is lots of good snarky insults exchanged between Ginta and his talking weapon Babbo. Babbo is a gentleman and thinks very highly of himself, despite looking like a bowling ball (actually he's one of those toy balls on a strong that you toss into a plastic cup). Babbo thinks Ginta is disrespectful and annoying...until he realizes that it's better off to be with an annoying kid that alone. By the end of the first volume, Ginta and Babbo have been joined by their new sidekick, Jack. I anticipate lots of funny dialogue between the trio in the future. MAR is okay. It has potential to grow into something that I'd like, but unfortunately, I don't feel invested enough in the series to want to continue. Have any of you read MAR? What did you think? Sorry you weren't that impressed with this manga! I like the colorful cover! I haven't read this one but maybe I will check it out! Hmm I'm going to check out the anime too! I'm just curious is there any Shonen manga you like? I love Shonen anime but can never seem to get into shonen manga, probably because its different watching the action scenes to reading it! I love snarky insults and if I even get the feel for shonen manga I may just have to pick this one up! Sorry this one fell through for you, Alison! I hate when that happens. I usually try at least 3 volumes of a series before I decide to pick it up. I dropped DNA Angel and Soul Eater (which still seems really popular) because they didn't hold my interest at all. I hope your next manga read is better. p.s. I hope to join your meme once I find some manga series to read. So far nothing seems interesting. I have never heard of this series and although I do like Shounen manga (prefer them in anime form though) this doesn't sound like a unique enough or interesting enough read for me to enjoy it. Great idea into turning this into a meme, I have come across a few other blogs that also do Manga Monday so this would be a great way to check out what other manga people are reading :). I will link my post later! Does it have to be a manga review done on Mondays only? Whenever I review manga, I usually review it on Thursdays, and not always every Thursday. Enjoy your reviews..love the linky tool! Plenty of things to review on your site..Thanks! !